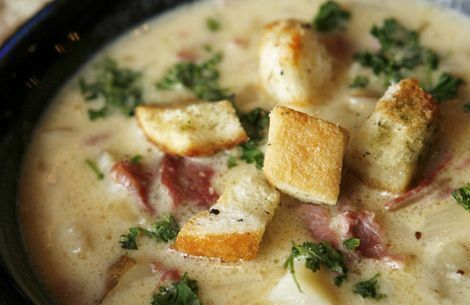 Food • Hearty soups  including staples of Utah bars  are the answer to a football fan's craving. Francisco Kjolseth | The Salt Lake Tribune The Green Pig Pub in Salt Lake City features its popular Reuben soup every Monday. Chef Adam Sinclair's recipe includes corned beef, cream, potatoes and a sauerkraut topping. 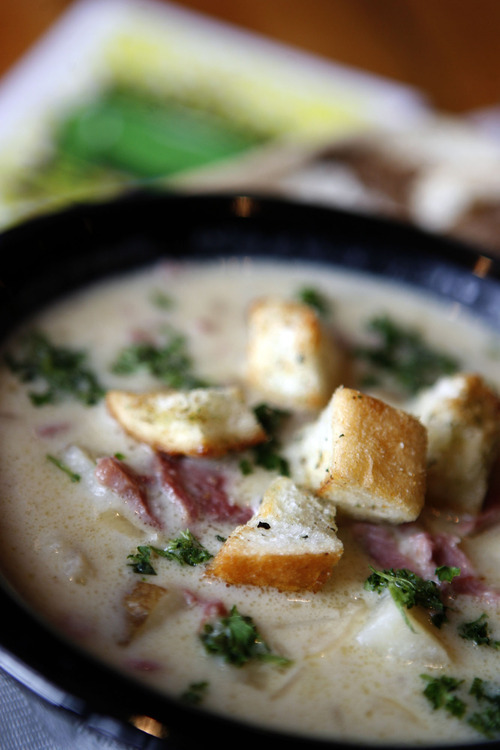 Francisco Kjolseth | The Salt Lake Tribune The Green Pig Pub in Salt Lake City features its popular Reuben soup every Monday. Chef Adam Sinclair's recipe includes corned beef, cream, potatoes and a sauerkraut topping. Sometime after the pre-game show and the half-time commercials, you've got to start feeding those hungry Super Bowl fans something substantial. Soup  the hearty, meaty, fill-your-belly kind  scores every time. 'I do' Pittsburgh • Italian wedding soup is a regional tradition in this city. Sometimes it's even called Pittsburgh wedding soup, explains Bob Batz, food editor for the Pittsburgh-Post Gazette. Despite the name, this isn't served at Italian weddings. Instead, the name of the soup refers to the "marriage" or melding of different ingredients, including meatballs, pasta and spinach or other greens. Dozens of restaurants in Pittsburgh serve their variation on the traditional recipe. This recipe published in Cooks Country magazine is a representation, Batz said. Other Pittsburgh food traditions: Big Macs, got their start in Pittsburgh, as did Klondike Bars and Heinz ketchup. For the cheeseheads • Besides being the home of the Green Bay Packers, Wisconsin is well-known for its award-winning cheeses and breweries. It's a tradition in the Badger State to marry these two ingredients in a rich, satisfying beer-cheese soup. This creamy elixir not only numbs the winter chill but is filling as well. Adam Kreisel, the chef/owner of Utah's Chaia Cucina, a consulting, catering and kitchen design company, shared his recipe for beer cheese soup. He suggests going local on the dish, using the Full Moon or Promontory Cheddar made by Utah's Beehive Cheddar Co. and a pale ale or India ale from a Utah brewery. Lentil love • Sean Wilde, the chef at Gracie's, said he created the bar's lamb bourguignonne with lentils by accident. One day, after the downtown Salt Lake City bar at 326 S. West Temple had sold out of its lamb special, Wilde said he wanted to use the "tasty lamb juices" that were leftover. "I made a soup with lentils and it turned out quite nice," he said. "Call it coincidence or mistake, it is one my favorites. We keep it in rotation about once every two weeks." If you don't have any leftover lamb on hand; use beef for this hearty French stew that includes mushrooms, tomatoes and red wine. Like a sandwich • Corned beef and sauerkraut are the beginnings of a traditional Reuben sandwich. These ingredients also are the base for Reuben soup at The Green Pig Pub, 31 E. 400 South, Salt Lake City. "I've taken all the ingredients we use to make our fresh corn beef and infused them into the soup," said chef Adam Sinclair, who includes potatoes, beer and heavy cream in this unique offering, which has become one of the establishment's most popular daily soups. "It's the best of both worlds," Sinclair said. South of the border • Since 1988, Utah sports fans have been celebrating game day at Lumpy's Sports Bar and Grill, at 3000 S. Highland Drive. About three years ago, Martin Gaucin, a long-time cook, created the now-popular chicken tortilla soup, which is made with garlic, onion, tomatoes, cumin and chili powder, and is thickened with a bit of cornstarch just before serving. Topped with tortilla strips, avocado slices, Mexican cheese and cilantro, "it's one of my favorites," says co-owner Chris Simonsen. Here are a few reminders on how to keep your Super Bowl buffet safe from food-borne illnesses. Hot foods • Soups, stews, chilis, casseroles and other hot dishes need to reach an internal temperature of 165 degrees. Once served, these hot foods need to be held at 140 degrees or warmer. To keep food warm, use chafing dishes, slow cookers or warming trays to keep foods warm. Cold foods • Keep dips, salads and other cold dishes in the refrigerator until just before serving. Once served, keep them at 40 degrees or colder by nesting dishes in bowls of ice. Two hour rule • Don't let perishable foods sit out for more than two hours. Serving • Always serve food on clean plates or use disposable plates. Replace empty platters rather than adding fresh food to a dish that already had food in it. Handwashing • Be sure to wash your hands before and after handling any party food and encourage your guests to do so as well. In a large soup pot, over medium heat, melt butter. Add onions and cook until soft stirring frequently. Add chicken and cook until meat is cooked through. Add garlic and tomatoes. Cook for 5 minutes, stirring frequently. Add chicken base, cumin and 1 tablespoon chili powder. (If you want the soup to be a richer orange/red add a bit more. ) Stir in beer. Bring soup just to a boil. Reduce heat and simmer for at least 20 minutes, stirring every few minutes. (The longer it simmers the better the flavor.) Taste. Add additional chili powder if desired. Just before serving mix cornstarch and cold water to create a paste. Add to the soup stirring constantly to thicken. To serve ladle soup into bowls and garnish with tortilla strips, avocado slices, Cotija cheese and fresh cilantro. Blanch potatoes in boiling water for two to three minutes. Drain. In a large soup pot, melt butter over medium heat. Add onions and garlic and sauté until caramelized. Sprinkle in flour to make a roux. Slowly pour in beer or water. Cook until reduced by half. Stir in chicken stock and cream. Add corned beef, sauerkraut and blanched potatoes. Stir in caraway seeds and Worcestershire sauce and bay leaves. Cook until soup reaches desired thickness. Taste and add red pepper flakes, onion powder, salt and black pepper. Remove bay leaves. To serve, ladle into bowls and garnish with parsley. In a large, heavy-bottom soup or stock pot set over medium-high heat, add butter and oil. When the butter has completely dissolved, add the leeks and cook them until soft and translucent, 3 to 4 minutes. Add fennel, celery, garlic and bay leaf and sweat with the leeks until soft, another 5 to 6 minutes more. Sprinkle flour over the vegetables in the pot and stir to incorporate, toasting for about 1 minute. Add the stock and bring the mixture to a simmer. Slowly whisk in the cream and bring back to a simmer. Allow to simmer for about 10 minutes more. Remove the pot from the heat. Remove bay leaf and discard. Allow the soup to cool slightly. Working in batches, blend the soup thoroughly in a high-speed blender or hand-held immersion blender until smooth. When completely blended, return the soup to the original pot and bring it back to a simmer. Whisk in beer, ground mustard and ground nutmeg. Bring soup to a simmer once more. Finally, turn the heat down to low, and working in small handfuls, whisk in cheese until it is completely melted and incorporated. Season to taste with kosher salt and ground black pepper. Remove the soup from the heat. Served with a drizzle of extra-virgin olive oil on top and a thick piece of crusty bread or a handful of herbed croutons. Heat a large stock pot. Add chopped bacon and cook until crisp. Remove bacon from pot, leaving the rendered fat in the bottom. Season the lamb with salt and pepper. Over medium-high heat, add the meat to the pan with bacon fat. Sear for two minutes. Add garlic, onions, celery and mushrooms. Sauté for 2 minutes. Add wine and beef broth, bay leaves and oregano. Bring to a simmer. Cover and cook for 45 minutes. Meanwhile, bring 3 cups of water to a boil. Turn off the heat and add lentils. Cover the pan and let the lentils sit for 15 minutes. (Depending on the variety and age of the lentils, soaking/cooking time may take longer.) Drain and add lentils into the soup for the last 5 minutes of cooking. Ladle into bowls and garnish with crumbled bacon, fresh chopped parsley and grated parmesan. For the meatballs: Using potato masher, mash bread and milk in large bowl until smooth. Add remaining ingredients, except ground beef, and mash to combine. Add ground beef and knead by hand until well combined. For the soup: Heat oil in Dutch oven over medium-high heat until shimmering. Cook garlic and red pepper flakes until fragrant, about 30 seconds. Add broth and bring to boil. Stir in kale and simmer until softened, 10 to 15 minutes. Stir in meatballs and pasta, reduce heat to medium, and simmer until meatballs are cooked through and pasta is tender, about 10 minutes. Stir in parsley and salt and pepper to taste. Serve with extra parmesan cheese and a drizzle of extra-virgin olive oil. Leftover soup can be refrigerated for up to 3 days. Servings • 6 to 8.